Review posted February 10, 2015. Houghton Mifflin Harcourt, Boston, 2014. 237 pages. I wrote this review before The Crossover won the Newbery Medal. 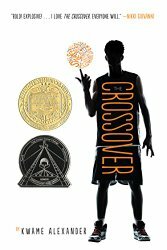 I was already thinking it would be a perfect book to booktalk, since it's about basketball, is short, and has many passages that read aloud well. Personally, I’m not a big fan of novels in verse, and I’m not a big fan of sports novels, but I couldn’t help but like what Kwame Alexander has done here. Twins Josh and Jordan Bell are the sons of a professional basketball player and the stars of their middle school basketball team. But disharmony comes between them when a girl falls for Jordan. Suddenly he’s all about her and hardly thinking about basketball. At the same time, their mother is worried about their father’s heart, and Josh can tell he should be worried, too. There’s family drama and sports action in this book, but I also liked the poetry. It starts out with an onomatopoetic rap about the joy of playing basketball and continues with plenty of variety of form. It ends up being an entertaining and engaging way to tell the story from an articulate young man who also plays basketball.